The new Freedom Wand is on the high end of a growing line of self wiping toileting aids. The Freedom Wand is an easy to use, sanitary toilet wiping aid for individuals who have difficulties with mobility or reaching. Very Portable! You can take this toileting aid in the ccarry pouch (included) with you inSTRONG> your purse, bbriefcase or bag. Carried in its pouch the Freedom Wand is so discreet, you can take it with you to work, when you travel and when using public restrooms. 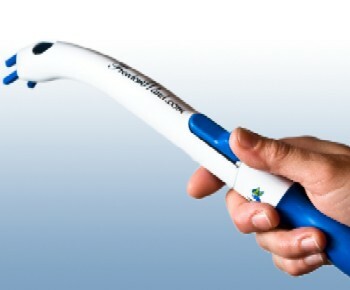 The Freedom Wand STRONG>holds a large wad of toilet paper, or a cleansing wipe if you prefer. You could also use it to hold a sponge and clean the areas you cannot reach while showering. You could use it to apply ointment to the sensitive parts of your body by applying the ointment to the toilet tissue. When you are finished, just "release" and drop the tissue into the toilet bowl without ever having to touch. The Freedom Wand™ comes in three section: the handle, the extension and the head. Use the Freedom Wand™ with the handle and head for a total of 14 inches in length or add the extension for 21 inches. How it is Used: The head of the Freedom Wand is 9 inches long and has a slight curve enabling a proper reach. The head also has four, four inch "fingers" that extend out of the wand with the slide of a button. As they extend, they open to hold your toilet tissue, bathing sponge or whatever you choose. When sliding the button back, the fingers go back into the wand, "locking" it in place and giving it a tight grip, strength and a smooth end. To release an item, just "unlock" by sliding the button. It is that easy! The Handle: The handle is approximately 9 inches long. It is contoured and covered with a rubber coating for a good grip. A loop on the end of the handle so that you can hang it in a convenient spot. The Extension: The extension is a 6½ inch piece. When combined with the head and the handle, the wand becomes 21 inches long. If a shorter wand is desired, the head and the handle can be put together without the extension for a length of 15½ inches. Both the extension and the handle have quick and easy release buttons. 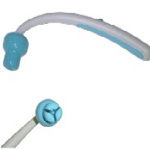 Freedom Wand Package includes:& Freedom Wand, an extension tube with grip attachment and the carrying pouch. Another optional additional extension is available that will bring the total length to 27 inches. The Freedom Wand is well made, sturdy and easy to clean. Made in America!